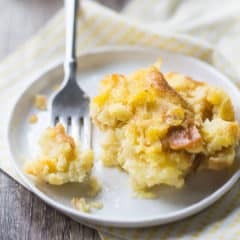 This baked pineapple stuffing is so good with ham dinner! 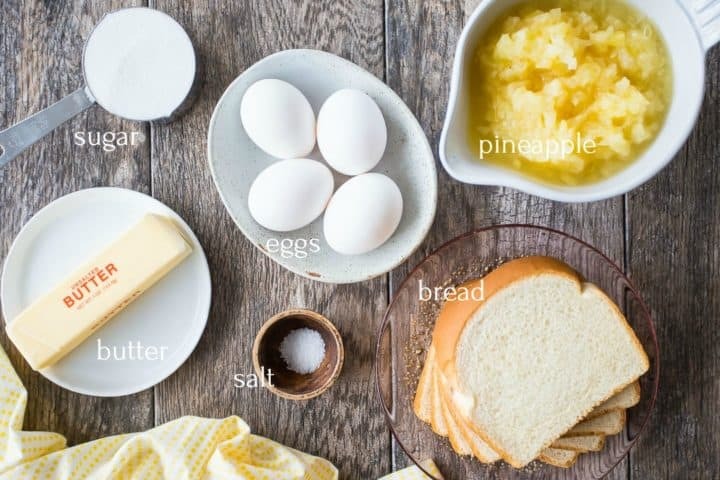 Made with soft bread, sweet pineapple, butter, and eggs. It’ll be the highlight of your Easter! Geez can you believe it’s Easter week already?! I thought I had a really good head start on all the Easter recipes, but somehow this still snuck up on me. It’s ok though, because over the years I’ve managed to build up a great stockpile of amazing recipes for the spring holiday. I’m especially partial to these coconut macaroons, these carrot cake cupcakes, and this pineapple upside down cake. Really, anything pineapple just screams Easter to me. I guess because it goes so well with ham. We always have ham for Easter dinner, and a few years back we started adding pineapple stuffing to the assortment of side dishes. This stuff is amazing! The inside is pillow-y soft and moist, and the edges get brown and crisp and a little chewy. It’s buttery and sweet, and it compliments the ham in the most incredible way. 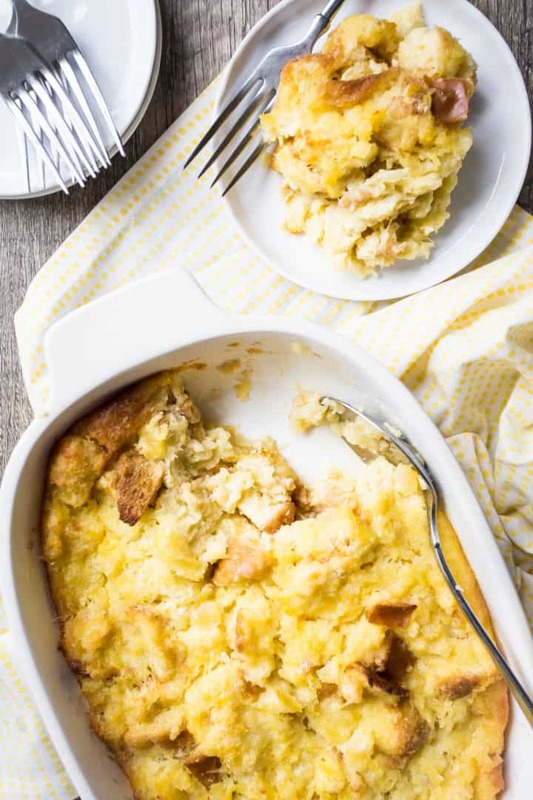 Once we tried it, there was no going back, and now it’s just not Easter unless this baked pineapple casserole is on the menu. 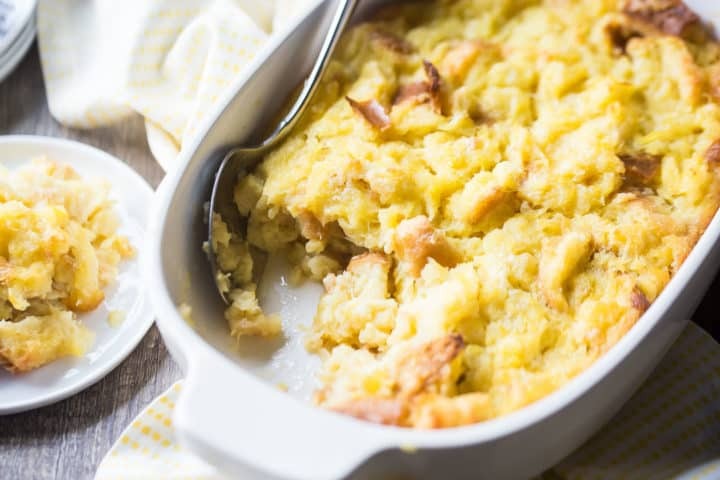 Pineapple stuffing is basically like a cross between a bread dressing (like you’d have with your Thanksgiving turkey) and a bread pudding. It made from cubes of bread, but it’s also sweet and rich and buttery. It’s easy to make and it will add so much to your holiday meal! Make sure you get a little of this incredible side along with every bite of your Easter ham. This yummy dish is made with just a handful of basic ingredients. 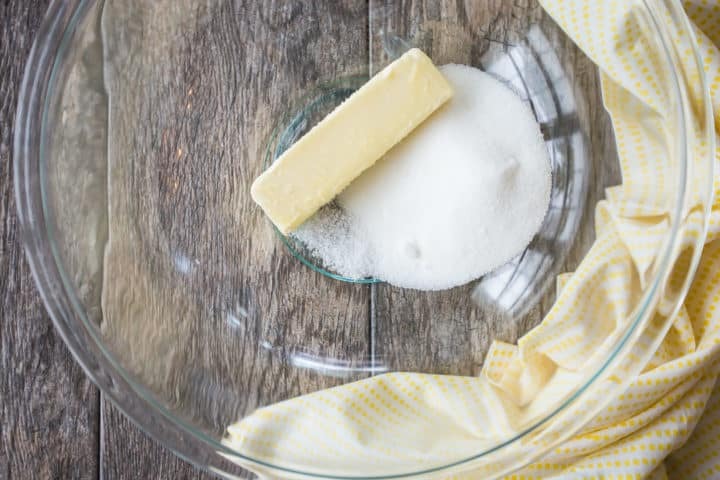 Start with the butter, sugar, and salt. 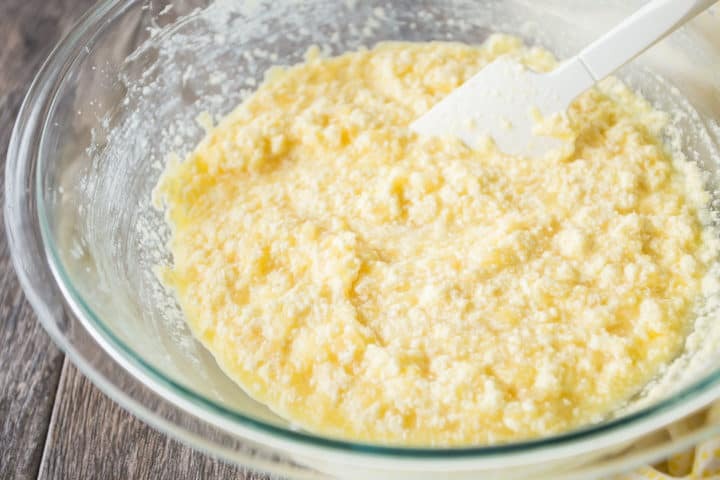 Place these three ingredients in a large mixing bowl, and cream them together with an electric mixer until they’re really pale and really fluffy. This should take about 5 minutes on high speed. Next, whip in the eggs, one at a time. 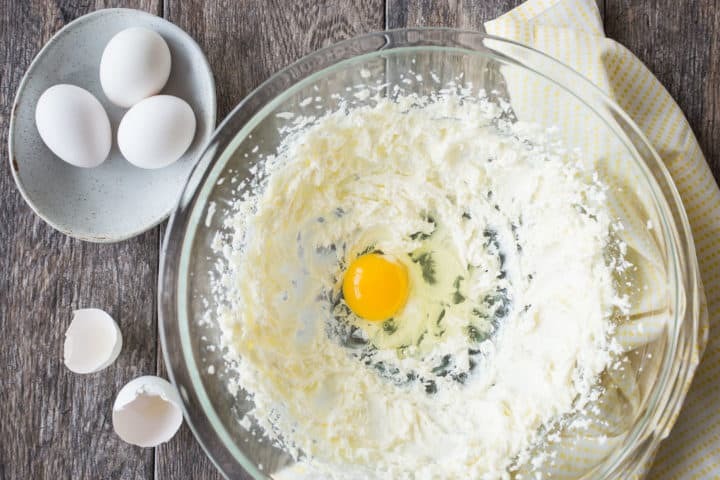 Allow each egg to fully incorporate before adding the next one. It’s also a good idea to scrape the bottom and sides of the bowl down with a silicone spatula after each addition. As you can see here, the mixture should look really soft and fluffy. Now you can add the crushed pineapple. Throw in the whole can, including the juice! It will make the stuffing extra sweet and extra moist. As you fold the pineapple in, you might notice the mixture starts to look a little curdled. This is totally ok! It’s just because there is a lot of liquid compared to butter, and water and fat don’t really like to mix. But don’t worry- as the casserole bakes it will all come together. The last ingredient is the bread. Just cube it or tear it into 1-inch pieces with your hands, then fold it into the butter/pineapple mixture. 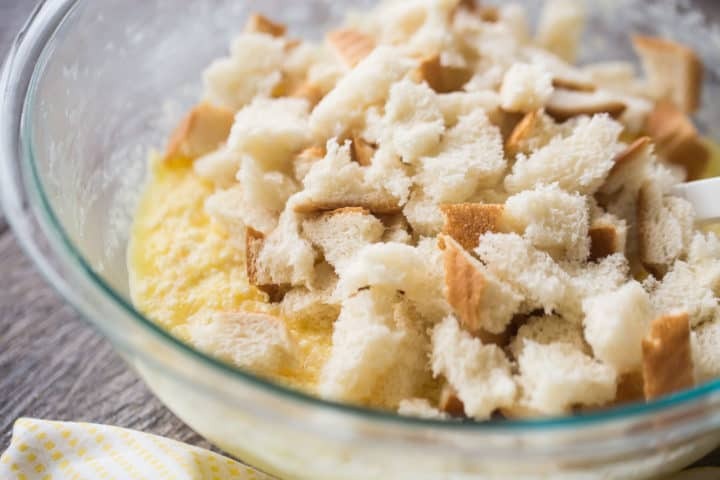 My favorite kind of bread to use for this casserole is just plain, soft white bread. But you could also use potato bread, brioche, or Hawaiian bread. Anything that’s really soft and just a little sweet will work well. Transfer this sweet, buttery, bread-y goodness to a lightly greased baking dish and bake it ’til bubbly and golden. Get ready- your whole house will smell incredible! This recipe will make your holiday prep super-simple. It’s a great make-ahead dish. You can either prep it and refrigerate it unbaked, or fully bake it and then reheat it just before serving. If you prep it without baking, it can be done a day or two ahead, and if you fully bake it, it will last for 3 to 5 days (tightly wrapped) in the fridge. CAN PINEAPPLE STUFFING BE FROZEN? Pineapple casserole freezes beautifully. Just cover it tightly with foil and it should keep in the freezer for at least a month. To reheat this dish, just place it in a warm oven (170 degrees F) until warmed through. Wrap it tightly in foil first, so it doesn’t become dried out. I’ve got a couple more Easter recipes to share with you over the next few days, so stay tuned! 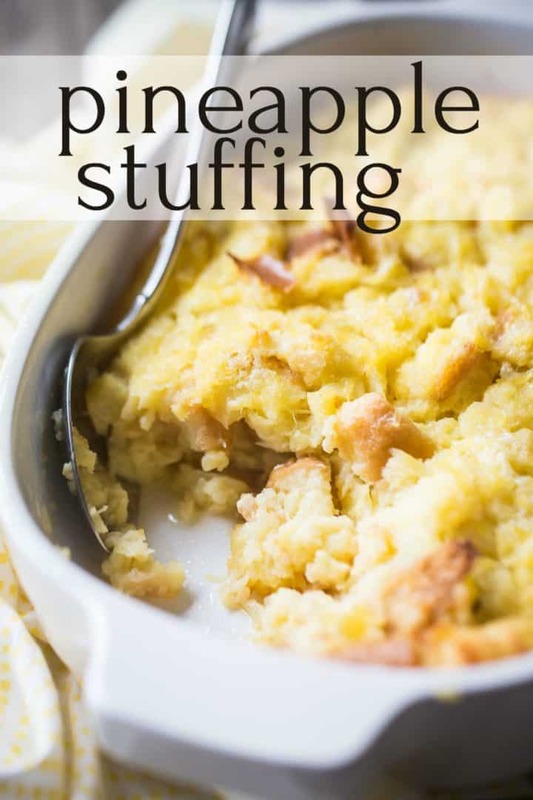 And in the meantime I hope you’ll add this delicious pineapple stuffing to your holiday menu. 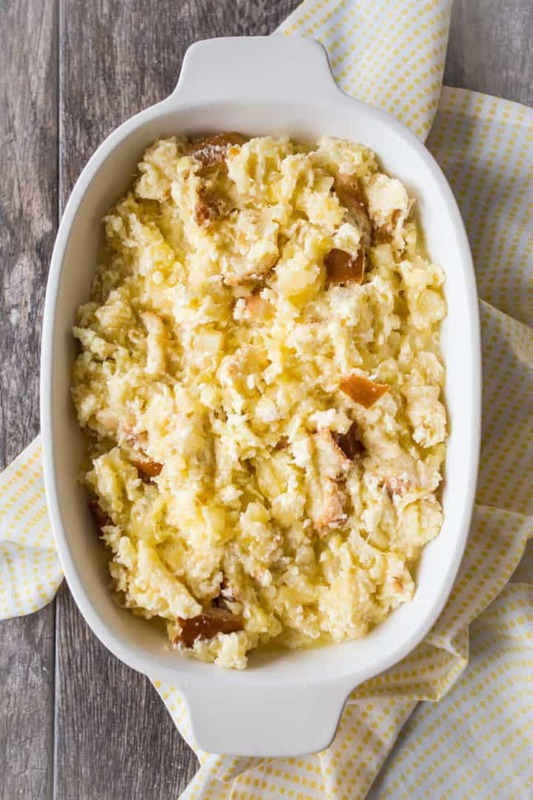 This baked pineapple stuffing is so good with a ham dinner! Made with soft bread, sweet pineapple, butter, and eggs. It'll be the highlight of your Easter! Preheat the oven to 350 degrees F and lightly mist a 1.5-quart baking dish with non-stick spray. 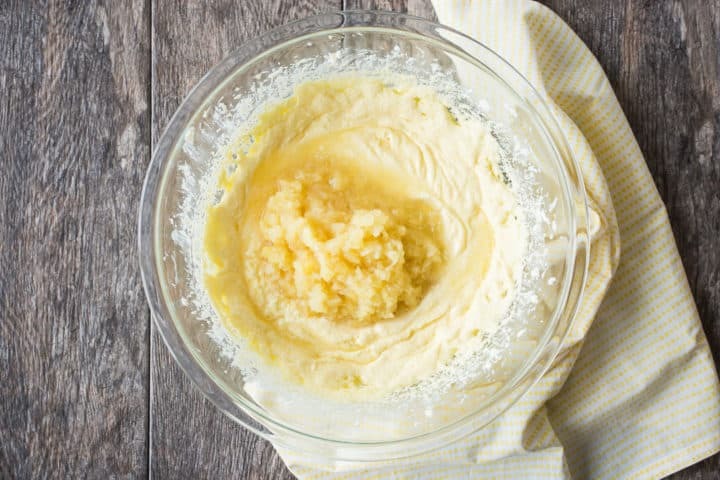 Place the butter, sugar, and salt in a large bowl and cream together with an electric mixer until very pale and fluffy (about 5 minutes on high speed). Whip in the eggs, one at a time, allowing each one to fully incorporate before adding the next. Scrape the bottom and sides of the bowl with a silicone spatula, and fold in the pineapple and it's juice. Tear the bread into 1-inch pieces and fold it into the pineapple mixture. 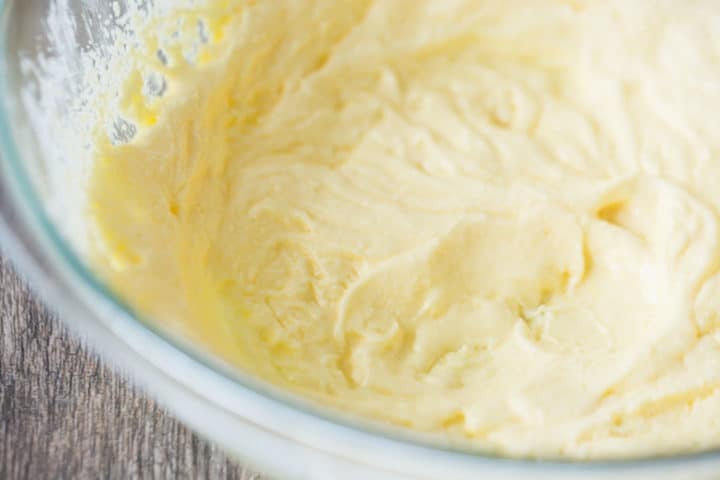 Transfer the mixture to the prepared baking dish and bake for 1 hour, or until bubbly and beginning to turn golden. *Use any kind of soft bread such as white bread, brioche, potato bread, or Hawaiian rolls. I made this recipe years ago…and am so happy to see it written down. Your method of assembling is different, and I’m looking forward to trying it again! Thank you also for letting me know you have an Oatmeal/Raisin cookie recipe. It is fantastic. Thank you! My pleasure Joan! Hope you enjoy this one as well! Okay I am making this for part of my take along food to an Easter dinner. I am loving the idea. Hope you enjoy Carol! Happy Easter! Can you make the Pineapple Stuffing in a crock pot? I’m sure you probably could but I wouldn’t know what the cook time should be without having tested it. I plan on making this for Easter & would like to know how many Hawaiian rolls are equivalent to one slice of bread? Thank you kindly! They come in all different sizes- so you’ll want to look at the weight on the package and figure it out from there. If you double the recipe you can probably just bake it in two separate pans and keep the bake time as is. Good luck!